Sewaktu memindahkan, mengcopy, browsing dan memunculkan info tentang file di Windows Explorer kadang menjadi pekerjaan yang membosankan, di internet banyak power add-ons untuk windows explorer yang bisa membantu kerja windows explorer lebih mudah dan cepat. Dibawah saya sertakan beberapa Free Add-ons untuk Windows explorer beserta keterangannya. Xentient Thumbnails Offers Actual File Preview: Replace Windows Explorer’s boring default image icon with a preview of the actual image itself as shown above. Xentient Thumbnails is a free download for Windows XP only. Xentient Thumbnails homepage. reaching for to every Explorer window with FileBox eXtender, which adds two small buttons that drop down a file menu, and a quick keyboard shortcut to get to those folders as well. Set up your preferred key combo (Adam suggests Ctrl+Shift+F) and type the first letter of the folder you want to select it. FileBox eXtender works in Open and Save dialogs as well, in Windows XP and Vista. FileBox eXtender homepage. TeraCopy Speeds Up Big File Copy Jobs: Get greater control of file copy operations—especially o nes that involve several gigs—with TeraCopy, a simple utility that offers pause, resume, and error recovery to your file copy jobs, as well as speeds them up overall. TeraCopy homepage. 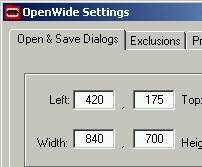 OpenWide Customizes the Open/Save Dialog File View: Set your Open/Save dialog to always list your files in details view, automatically focus your keyboard where you choose, and even place the box’s exact location on your screen using OpenWide for Windows XP and 2000. OpenWide homepage. Folder Size Sorts Folders by the Size of Their Contents: Add a column to Windows Explorer that displays how much space a folder’s taking up with Folder Size, a small utility that also lets you sort by folder size as well—making quick cleanup of empty or space-hogging folders a snap. FolderSize is a free download for Windows XP only. Folder Size homepage. PlacesBar Editor Adds Frequently-Used Locations to the Open/Save Dialog Box: Save and open files straight to your most frequently used files by adding them to Windows’ Places bar using the PlacesBar Editor. Unlike PlacesBar Tweaker, PlacesBar Editor works for Microsoft Office dialog boxes, too. PlacesBar Editor is a free download for XP and Vista, donations requested. PlacesBar Editor homepage. InfoTag Magic Displays File Details on Mouse Hover: Peek inside a file with InfoTag Magic, a small utility that displays a file’s metadata (like MP3 tags) in a tooltip when you hover your mouse pointer over the file. Windows XP only. InfoTag Magic homepage. Hey, I was looking around for a while searching for window security update and I happened upon this site and your post regarding windows explorer dengan Free Add-ons | Network World, I will definitely this to my window security update bookmarks! “A wonderful article you posted. That is so informatory and creative. Please keep these excellent posts coming. You helped me so much. Such good enough stuff just like this topic would be included in dissertation or in the thesis writing to buy research papers online from the paper writing services. Very often, some students, which require the essay writing online, do not actually know the correct way to get that. But that is real to buy research paper from the professional term papers writing service. That is a standard issue for some people.